I officially go back to work July 27th to start training our new teachers, so summer is basically over for me. It's been a good one. Our travel plans fell through and my leg debacle caused some stress, but mostly I really enjoyed my time off. In June we had a week straight of heavy rain, but I was able to take advantage of the few days of sun and enjoy our backyard. I took time off from working out to catch up on reading and writing for fun. It felt so good to be a total hermit and avoid socializing for a couple weeks. We went up to Sarasota for Father's Day and Matt taught my family how to use his One Wheel. I always love it when all of us are able to get together, because it usually only happens at Thanksgiving. This video of my mom on the One Wheel always cracks me up. She did a great job! My brother was so nervous; he really didn't want her on there. 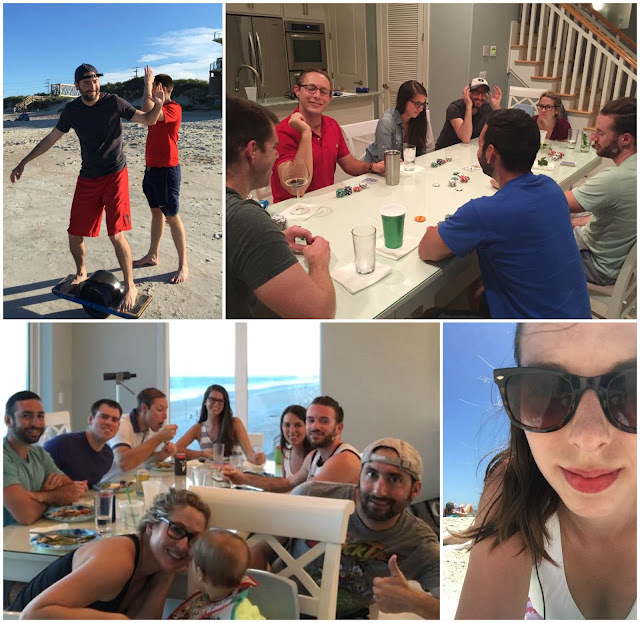 Although we didn't get to New York this summer, as was our original plan, this past weekend Matt and I made a weekend trip up to Mark's family beach house in St. Augustine to see a handful of our college friends; it's always a treat to see them and catch up. Sean always cooks for us when we do these trips, and this year he made sure everything was totally gluten free! In big workout news, I finally joined a gym. Planet Fitness totally got me with their $1 signup special. After doing the math for the yearly cost, I decided it was worth the membership, especially if it means I'll have some accountability for going. I also talked Elizabeth into joining! I just feel like I need more beyond our classroom workouts this year. I was brave and went by myself the first day I joined! The gym is a half mile from my house, so I can run there, which is a major plus. And when my runs get rained out now, I'm a two-minute drive away from a treadmill! No more excuses! Although I worked a little here and there over summer, it definitely felt like a long enough break. I am excited and ready to head back to work! Did you go anywhere this summer? How do you most like to spend your downtime? Yay for you going to the gym by yourself--that's hard the first time! The video of your mom is just great! I love it. Glad you enjoyed your summer. Your back yard looks lovely. Yay for being able to run to the gym! That's so convenient! Welcome to the Planet, Ali!! Are you getting comfortable there? Summer is ending fast. I still have a few weeks left. Why did your NY plans fall through and what were you going to do there? I was waiting to find out about my calves for so long, and if I'd have surgery, that planning the trip was tough. Once I had answers, my free weekends didn't match up with the friends we planned to visit. We are still planning to go during spring break maybe! I am impressed by your Mom on the one wheel!